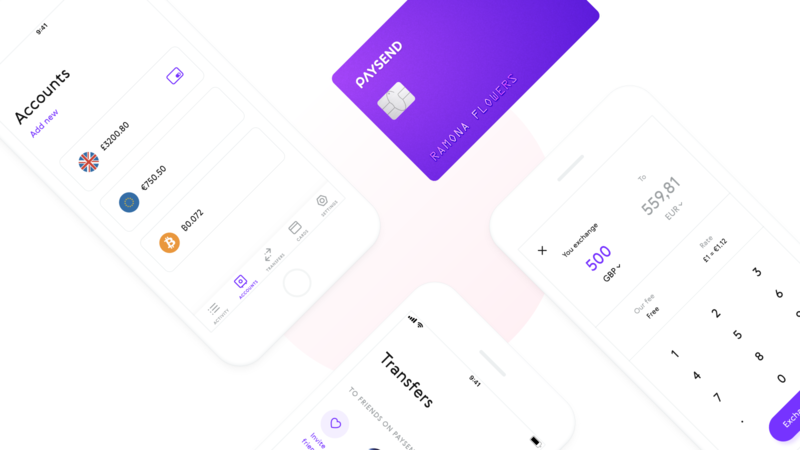 Meet Paysend’s global account, a new way to hold, spend and send money in multiple currencies using a mobile app and a card. It looks a lot like Revolut’s basic features. But the company is trying to provide a more focused and robust experience from day one. “We are quite different from both a technical infrastructure and consumer offering viewpoint. We own and control our own processing and this gives tremendous ability and flexibility to deliver a wide variety of services whilst controlling the entire consumer journey,” Head of Product Alex Murashko told me. And it’s true that Revolut has launched so many different features that it’s hard to keep track of what you can do with your Revolut account. For instance, you can insure your mobile phone, save money using vaults, buy cryptocurrencies, subscribe to a travel insurance package and more. So Paysend went back to the drawing board to focus on the essential. The company lets you top up and hold money in EUR, GBP, USD, Russian rubles and Kazakhstani tenge. Paysend is partnering with Bitstamp so that you can buy and hold cryptocurrencies in the app as well. You can then covert your money into any of those currencies at interbank exchange rates with a 1 percent markup. Revolut tries to stay as close as possible to the interbank rate during weekdays (except on a handful of currencies) and adds between 0.5 percent and 2 percent markup during the weekend depending on the currency. What if you’re traveling to another country? You can use your Paysend card to spend money and withdraw cash in 125 currencies. You decide in the app the backup currency that you want the company to use. When it comes to sending money, you can send money for free to other Paysend user, or send money instantly for €1 or £1.5. The company doesn’t initiate regular bank transfers. Paysend has worked on card-to-card transactions instead. You enter the card number of your friends and family members to send money to their card directly. Sometimes, you need to send money to someone you don’t know that well. You don’t have to ask them for their card number. You can generate a payment link and send the link. The recipient can then enter their own card number to receive the payment. This card-to-card transfer feature has already been live for a while as a standalone product. Going forward, global accounts will become the flagship product, but standalone transfers will remain available. Paysend has already raised $20 million and there are 130 people working for the company. Global accounts are still in beta and should roll out to European users soon. While Paysend is still a young and intriguing product, it’s going to be interesting to see how it evolves. In addition to card-to-card transfers, the company will differentiate its product from its competitors even further over time. Correction: I clarified Revolut’s exchange fees.